In preparation and scheduled for 2019 publication is the copiously illustrated Essential Wedding Photography. It will be Book Two in my Really Useful Books large format of 170 mm x 244 mm (6.69" x 9.61"). It is probable that the paperback will be printed in mono with the e-book a facsimile of the paperback but in colour. Every aspect of photographing a wedding will be covered in the book. 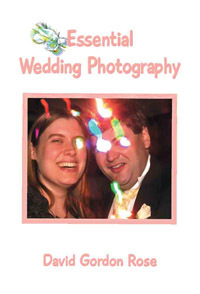 It includes sections on what photographs are expected by the bride, groom and family and pictures they might not know they should have. There are pointers to what the photographer should be talking about with prospective clients at Wedding Fairs, including picking up on what they (usually mother and daughter) are concerned about. The book progresses through a typical wedding day, from informal shots of the bride and bridesmaids (and groom and his entourage) getting ready at the beginning of the day, through to the celebrations at the end of the evening. The book doesn't cover peripheral things such as wedding albums, literature, contracts, flowers, vehicles, couture or photographic equipment. Just the picture-taking. You need to be one step ahead of the order of events, particularly with when and where you should be positioned. Be under no illusion, wedding photography is not an easy photographic option. Be aware also the actual photography on the day is only half your work. You may have taken a thousand pictures (if you're a masochist) and will need to be efficient in organising the pictures and in processing them ready for printing. There are tips on the tweeking your pictures will probably need. Outside the church watch for bride or groom brushing confetti away, or a straightening of veil or cravat. It's a nice first marital act. You could even stage it. Make sure the husband helps his bride into the car after the reception. Many young grooms have not learnt this bit of gallantry! Don't photograph him stooping either - it looks submissive. Before the first appearance of the new Mr. and Mrs. at the reception, look at where they will enter and the path they will take to the top table. Stand on a chair mid-point so you can take quick shots in succession of the couple, clapping guests and their arriving at the centre of the top table. Get the help of someone with a loud voice for rounding up family for group shots. This is not necessarily the Maid of Honour or Best Man. Photograph as much as you can in quiet moments including flowers, place settings, the all-important card with the first instance of the bride's new family name, the cake knife, table-settings diagram, starter course (untouched), the bridesmaids' presents, children playing peek-a-boo and so on. There are a half-dozen must-have shots at the speeches. Tearful Dad and daughter looking at each other ... toast to Dad for his generosity ... groom's discomfort at what his Best Man is about to say ... ladies in attendance receiving presents from the bride ... the list goes on and on. Weddings are daunting but are conquered picture by picture. The challenges become easier as you gain experience. Aim for mastering tricky situations (particularly in lighting) to become second nature. Lighting is the prime consideration. The lighting of a subject is, after all, what photography is about. Here are four pictures and brief comments. I cover many more aspects in detail in the book. 1. Technique, especially in lighting. 2. Examples of weddings details and how to frame them. 3. Moments to capture with the bride and groom. 4. Grouping. Here, the light background, bright sky and fill-in flash helped the camera meter Ian perfectly, leaving Yvonne underexposed. Her face details were hardly visible. This is what an informal pre-wedding shoot is good for sorting. To correct the image on the computer I reduced the cyan+black on the Reds in Selective Colour (in Photoshop). Not too much that Ian becomes pale. I used the Dodge Tool (drop shadow square brush, size approx. 250 px, Highlights 5%) and brushed Yvonne's face avoiding edges and brighter areas. You can see I lightened her nose and left cheek too much. Use the same brush on her hair with Midtones 5% but not too much or her hair will start greying. In summary, expose the main picture correctly, reduce reds, dodge Yvonne. At this wedding I photographed shoes as they had been left on the bed. Look also for button holes, bouquets, wedding cards and a bottle of champagne on the kitchen table while waiting for the bride to dress. If you can get close-ups of the bride's jewellery and gifts to the bridesmaids and ushers before they are wrapped that is also good, otherwise don't forget presentation time by the top table (or the bride and groom walking to other tables) and a peek at the gifts as they are opened, hopefully with wide-eyed appreciation. In the Preliminaries section of the book I also put in shots of bride and/or bridesmaids getting ready with dress and hair details and fitting of tiara and veil. Moments specific to the couple are nuggets. They include catching the Registrar handing the marriage certificate to the bride. Vicars rarely do this, female registrars always do. After the throwing of the confetti, the bride picking confetti off her husband's lapel is a good one, a first 'wifely duty.' It could also be the groom removing a piece of confetti from his wife's hair, or cleavage. During the meal when they are a little more relaxed, catch them whispering to each other and/or making a discrete toast. If it doesn't happen, set it up. All moments of adoring looks are good for the tone of the album. 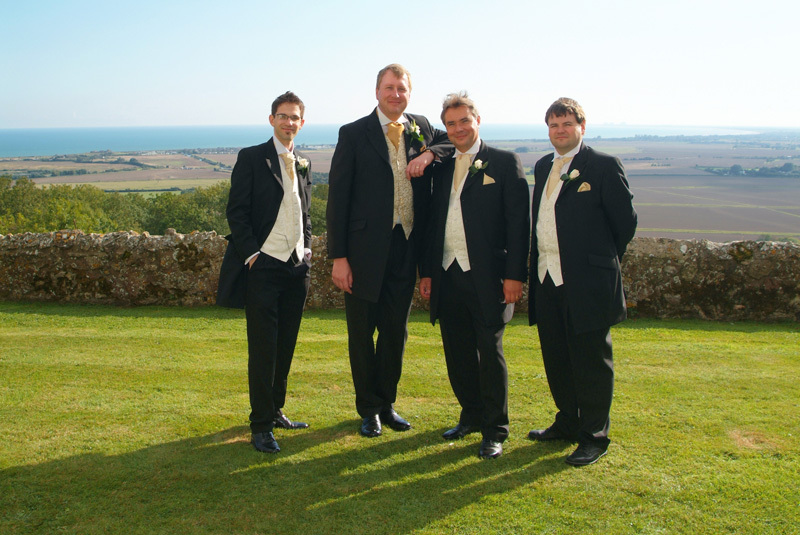 The bride or groom will not necessarily have a clear idea of how they want the group shots done and will leave it to you. Some formality is required and this is usually helped by a grander setting. One bride was wondering why I was requesting help in making sure I got the relevant family members in. Her mother told her the group shots were the ones she would be looking at in years to come. I have also been thanked after a wedding for paying particular attention to older family members. It goes without saying they may not be around much longer. You get the idea of how much there is you need to know! Read the book and you're halfway there.